When setting a goal, consider that 194 is currently the minimum passing score for USMLE Step 1, and 229 was the national average in 2017 (the most recent year for which data is available). However, depending on the specialty into which you desire to match, you may have to aim for a significantly higher score. If you’re not sure what specialty you want to pursue, you’ll want to score as highly as possible, though you probably want to do that anyway. 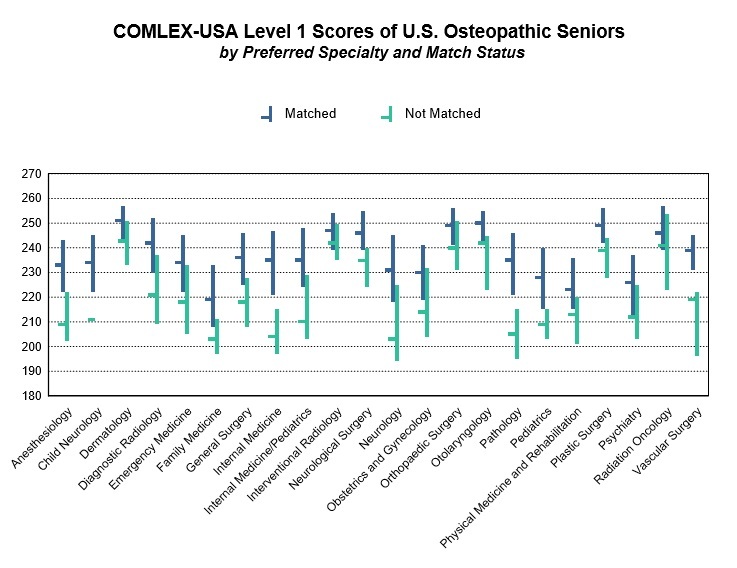 Below are charts summarizing average USMLE and COMLEX scores by specialty in the 2018 Match. All data and the charts come from the National Residency Matching Program's (NRMP) Charting Outcomes in the Match, 2018 which is available here. After taking USMLE Step 1, many students say they wished they used the resources they used to study for USMLE Step 1 during their courses in the first and second years of medical school. Choosing the right resources depends partly on your learning style. However, you should start preparing for the USMLE Step 1 as soon as you begin medical school by reading the sections that go along with your class lectures. This will help solidify your memory of the topic and will also make you familiar with the review resource when it comes to your dedicated time to study for USMLE Step 1. Find out early on what you school or institution will give you in terms of time off before starting third year clinical rotations. This will help you can manage your Step 1 study time during year one and year two. Before you begin any dedicated studying, make a schedule that includes breaks and time to eat. This should include days for taking full practice tests so that you build the mental stamina required and so that you can see how you’re doing with the online score predictors. There are many examples of study schedules available online. If you create or use a schedule that isn’t working for you, change it so you have time to study what you need to study as well as time for practice tests. Most authorities recommend 2-3 months of dedicated study time in order to prepare for USMLE Step 1. Dedicated study time should be treated like a full-time job that generally requires 6-8 hours per day, six days per week. However, the amount of time you spend studying each day depends on your own endurance. Studying 10+ hours per day may cause mental fatigue, and you won’t see the return on the time you invested. Your study time will be a mixture of reading and applying that knowledge with questions. Early on, it’s most beneficial to focus most of your study time on reading from a review book or two. This will allow you to review all of the relevant material and gather facts and data. Make sure you study what you don’t know so you can master these subjects rather than just the topics that you do know well. Do some questions early on so you get a feel for the USMLE Step 1 question format. Do both random questions and timed blocks so you get used to the pacing of the exam. Focusing too much on questions early on will not be effective since you don’t have the knowledge base. As you get closer to the exam, the majority of your time should be spent doing blocks from the question banks, not only to apply the knowledge that you’ve learned but also to build your mental endurance. In the last month before you take the USMLE Step 1, try to do 2-3 blocks per day on the question banks. USMLE World and Kaplan are the most popular question banks. Regardless which question bank you choose, complete as many practice questions as you can. Read the detailed explanations of why the correct answer is correct and why the incorrect answers are wrong. This will help make the question bank a high-yield and efficient study tool. Optimize study time by getting plenty of sleep and exercise, and don’t forget to socialize periodically. These activities will keep you mentally fresh and better able to learn and synthesize information.